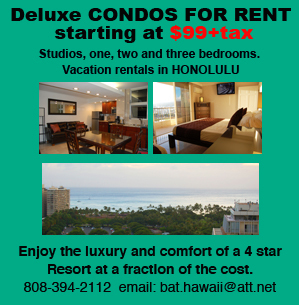 Ala Moana Hotel, Condo and vacation rental review. # 1 in our Waikiki map. Address: ......... 410 Atkinson Drive. 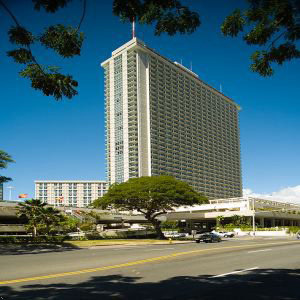 Built in 1970 with 35 floors and over 1000 rooms, the Ala Moana Hotel has gone through various ownerships and management/marketing companies but over the years it kept the same name. With ample common areas, lobby and several restaurants and shops to choose from, the Ala Moana Hotel has housed scores of visitors and locals alike. In 2006 the hotel underwent a deep transformation when it was totally renovated and each unit sold as a condominium. The majority of the new individual owners participate in what is called a "hotel pool" that gathers individual condos and operates just as a hotel. From the standpoint of the visitor, the fact that it is a hotel-pool makes no difference but from the owners perspective it means that each unit belongs to a different individual and is run by the Hotel Management as a Hotel operation. Like everywhere else, parking is available but will cost you a daily fee. This hotel is number "1" within the green zone of our waikiki map, click here to see it's location in relation to other hotels in Waikiki. It is a large hotel and it "feels' like it, with spacious common areas, pool area, fitness center, several restaurants and shops. It is just across the street from the Honolulu Convention Center, it's location is invaluable for those attending any event there. It is located behind the largest Shopping center in the State of Hawaii, the Ala Moana Shopping center, so if shopping is your goal, this is the right place. Even though it is right next to Waikiki, It is technically outside the area and this makes it very popular with those travelers coming to Honolulu for business, since there is less traffic to deal with than for a Hotel within Waikiki. Even though this hotel is only 15 to 20 minutes walk from the center of Waikiki, if you are here for a few days and you want to be in the "heart of everything", it may feel too far. There are 2 different towers in this hotel, the Waikiki Tower and the Mauka Tower, the latter one is shorter than the former and has large windows with balcony railings but not a balcony that you can step out to, the rooms at the Mauka Tower are also smaller. If you have a choice, choose the Waikiki Tower. The Ala Moana beach is only 15 minutes walk from this hotel but many travelers seeking a Hotel of this category prefer to be closer to the ocean.